ENNIS, TX (Mar. 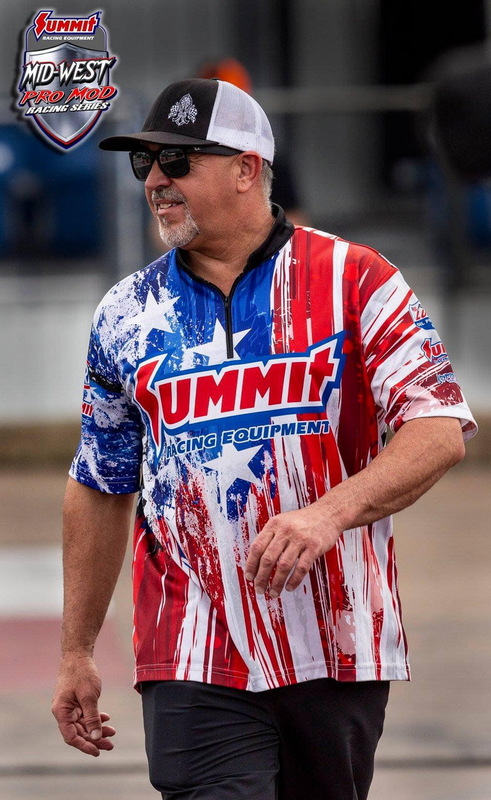 13, 2019) -- Consistency and an oh-so-close result in the semi-finals left Tulsa-based Pro Mod star Keith Haney feeling very positive about the season-opening Summit Racing Equipment Mid-West Pro Mod Series event Mar. 9, at the Texas Motorplex, near Dallas. "Seventeen-thousandths at the stripe, that's all that separated us," Haney said of his race against young gun Justin Jones, who won with a 3.69 over Haney's 3.73 at more than 201 mph. "I treed him with a .002 light to his .023 and I even had him at half track, but my car started shooting sparks out the right header and laid over a little and he was able to just sneak on by me at the finish." Beyond reaching the semis, Haney left the Motorplex feeling impressed with his team's overall performance and encouraged by their strong start to the 2019 MWPMS season. "You know, the notes that we had from November sure helped Brandon Switzer do his job on the tuning side of it, but what's really exciting as far as Keith Haney Racing goes is that we were out there last November at the Elite 16 race going 3.70s and we showed up in Texas again and went right back to running 3.70s. That tells me we're on to something and you've got to commend my guys for what they did in the off-season to prepare the car and keep it consistent. "They did a great job all weekend. I call it showing up and showing out, you know? I mean, we went there to drag some butts all over the place and we did, a few; got down to the final four." 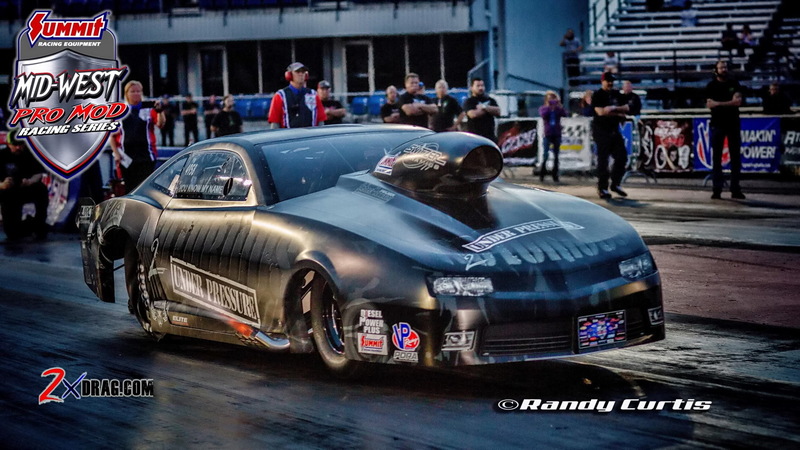 After qualifying third with another 200-plus-mph pass in 3.74 seconds over the Motorplex eighth mile, Haney and "Notorious," his nitrous-injected 2014 Pro Mod Camaro, ran 3.74 and 3.73 in defeating the entries of E.J. Hickl and Ed Jeffe before reaching Jones, who went on to finish runner-up against Frankie "Madman" Taylor in the final round. "You know, in the staging lanes before we ran, Justin told me that it's been one of his dreams to race me and of course I appreciated that," Haney said. "He's young, maybe 19, 20 years old, less than half my age, so he's got better eyes than I've got. But I looked at him and said, 'Don't go red.' He looked right back at me and said, 'Don't be late.' And as it turned out, he was late and I was not red--well, he had a great light, but at least he was late compared to me." Also contributing to Haney's positive mood was a relatively stress-free weekend of racing and camaraderie with his fellow MWPMS competitors. "The guys from the Motorplex did a great job and the track was phenomenal," he declared, pointing out several classes posted record-setting numbers. "And as far as my team goes, we really didn't haven't any problems at all, no breakage, no big thrash in the pits. It was kind of awesome, you know, we got to relax a little. "One of the things that we did was on Friday night I helped cook for about 80 to 90 people. Andrew Arnold, myself, and my girlfriend Misty, all three of us got Hibachi ready and we cooked for a bunch of teams. We all got to sit around and tell jokes and everybody got to relax and have some fun. "And you know, that's really what it's all about. All of us there, we all want to win, don't get me wrong, but at the end of the day we're spending time together and spending time with the other racers when we're not on the track. When we're out on that track, though, none of us are friends. It's winner take all and I wouldn't want it any other way." Keith Haney Racing will be back in action with the Mid-West Pro Mod Series Apr. 12-13, during the 6th annual Outlaw Street Car Reunion at Beech Bend Raceway Park in Bowling Green, KY.
Based in Tulsa, Oklahoma, Keith Haney Racing (www.keithhaneyracing.com) fields two cars in the Mid-West Pro Mod Series (MWPMS), as well as for select NHRA and PDRA races and one-off special events. Keith Haney Racing appreciates the support of sponsors Summit Racing Equipment, Lucas Oil, Strange Engineering, Kryptonite Kustomz, RacingJunk.com, MoTeC Systems USA, Switzer Dynamics, M&M Transmission, Menscer Motorsports, Total Seal, Mickey Thompson, Browell Bellhousing, and Larry Jeffers Race Cars.